It's 88.7 right now. High of 115, low of 80. I am questioning the wisdom of biking tomorrow morning, but I'll see how it is at the time. Strangely, there isn't any hot water tonight...hmm. I had to empty out the horse water troughs today, the water was actually HOT. It usually gets warm during the days in the summer, but it was HOT. Ugh, that's not fun at all, I think the 117 degree time was when I was out there doing that! Hopefully I'm not going to have to do that every day, it's a pain. Maybe I can just siphon out most of the water if I need to, so that I don't have to mess around with trying to catch all the mosquito fish (if you don't know what those are, they're little fish that eat mosquito larvae, and whatever else ends up in the water). I had a very productive weekend on the artistic front, got a lot of Standard stuff done. Recently I read about these things called "ACEO's" which stands for "Art Cards, Editions and Originals." Apparently they are quite the thing and a lot of people are crazy about collecting them. I guess it's like a trading card. They are 2.5 by 3.5 inches, some are original artwork and some I guess must be prints of originals. Obviously I know very little about these things. But I had a little time on my hands this afternoon. It was a gazillion outside and I was awaiting feedback/answers on several Standard-related questions, so rather than twiddle my thumbs I figured I'd do a quickie art project. It's really quite nice to create something where I don't have to check with anybody or get it approved or anything! You'd think I'd draw something other than a chicken, like *anything* other than a chicken...but no. I keep thinking I need to get into the game fowl stuff a bit, I think that would be a lucrative market. 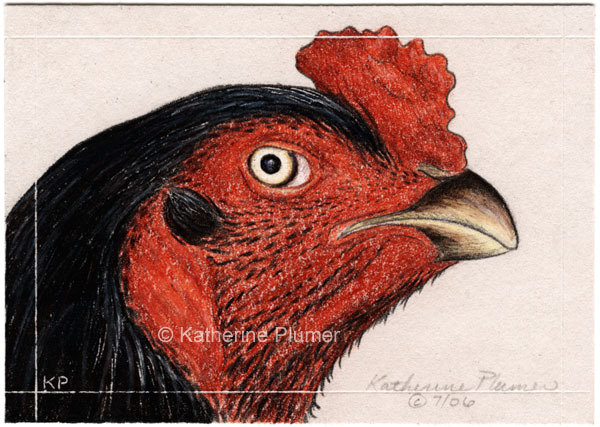 So, here we have my first ACEO, which is pretty much just a small drawing and will be priced as such. I LOVE the gamefowl you've done katherine! These are wonderful! !